Bantam Press, 09/01/2000. Paperback. Used; Good. **WE SHIP WITHIN 24 HRS FROM LONDON, UK, 98% OF OUR ORDERS ARE RECEIVED WITHIN 7-10 DAYS. We believe you will be completely satisfied with our quick and reliable service. All orders are dispatched as swiftly as possible! Buy with confidence! Bantam Books, 2000-01-01. paperback / softback. Paperback. Good. London: Bantam Press. Very Good+; Light reading and cover creases, some foxing to inside covers . and edges of reading block. ; Nice tight copy, no names inside, wrap . around cover artwork by Steve Stone. Very heavy book and priced . accordingly.. 2000. First Edition. Paperback. Trade PB . 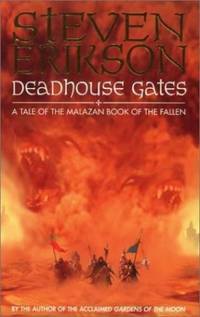 First Printing; The Malazan Book of the Fallen Series; Vol. 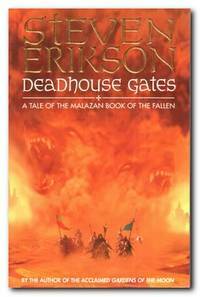 2; 704 pages; Weakened by the events in Darujhistan, the Malazan Empire teeters on the brink of chaos. In the vast dominion of Seven Cities, in the Holy Desert, the seer Sha'ik gathers an army around her in prepation for the long prophesied uprising named the Whirlwind. Unprecedented in it's size and savagery, it will embroil the Empire in bloody conflict, a maelstrom of fanaticism and bloodlust that will shape destinies and give birth to legends. ; 0593046226 . London: Bantam, 2000. 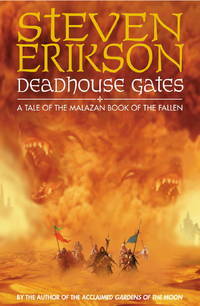 Steven Erikson- Deadhouse Gates - True first edition,first impression of this book- released before any other editions. U.K Bantam Press 2000 ,priced £10.99. Near fine covers - very light odd crease edge covers- spine clear apart from what looks like a small production crease. Contents near fine- usual page edge browning common to this book- no ownership inscriptions. Becoming harder to find in collectable condition. P. First Edition. Soft Cover. Fine.